Safety first, every time. 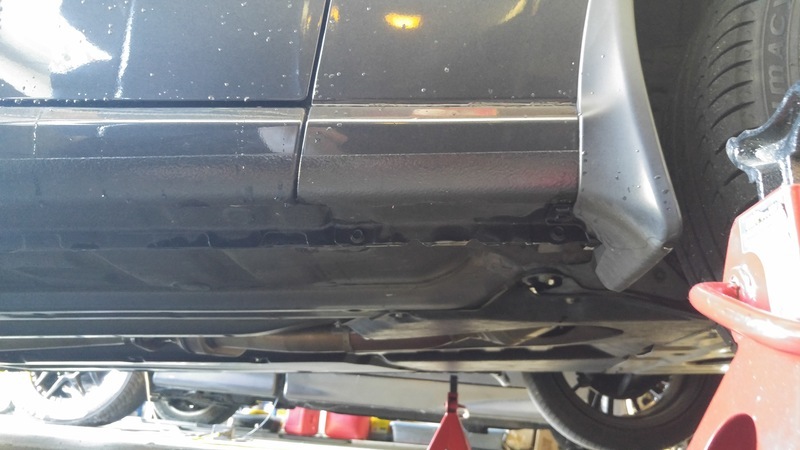 Never ever get under a car that isn't securely held by solid supports like a jackstand. Never ever get under a car that's only held up by a jack. There are no exceptions. I did it once, and looking back I feel like an idiot. You get excited about getting to work, you forget the jackstands at home, or your just in a hurry to get done. Just stupid. I've seen too many jacks fail. I've personally lost a friend to a jack failure, and you hear of one every now and then. It's just way too stupid of a reason to die. Do it right, take care, and don't compromise. Choose a nice flat, even surface to park your car. Turn it off and put it gear. Securely apply the parking break. Place wheel chocks behind the rear wheels. The front center jacking point is just past the bumper. Slide the jack under. Take care to watch that the handle doesn't hit the bumper and the jack has plenty of room. As you can see, mine barely fit on a stock FR-S which is why I linked this low profile jack in the tools section. Tighten the jack by rotating the handle clockwise. Watching closely, position the jack lift pad directly under the lift point and make sure it's in the center of the pad and the jack is not crushing anything. Pump the jack several times, checking the pad position. Lift the front of the car just high enough to place the front jack stands. Locate the front most jack point. 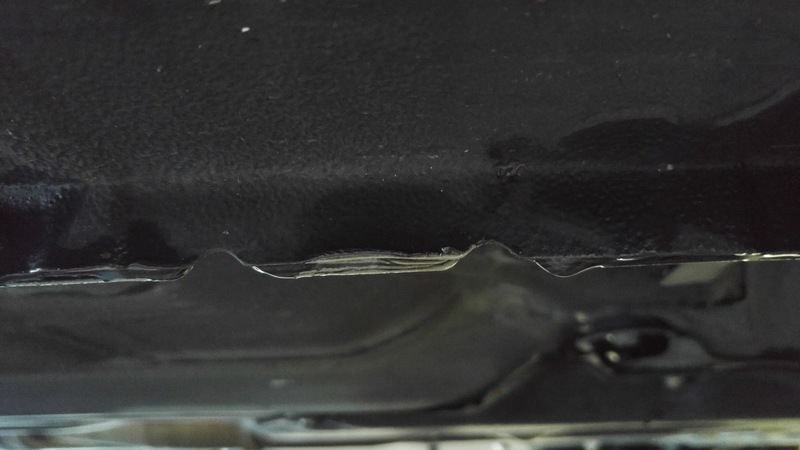 These notches in the pinch weld are a universal indication of where you can jack the car from. We'll use these points to place the jack stands. 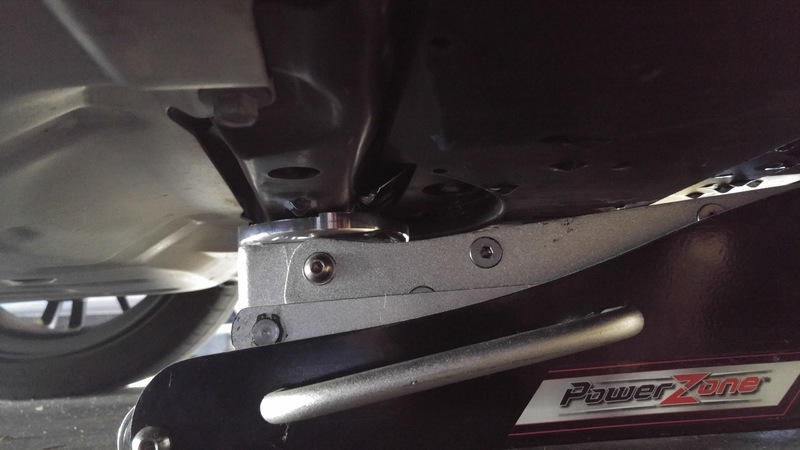 Adjust the jack stand to the position closest to the height you currently jacked the car up to. Slide the jack under the pinch weld. Make sure it's located between the 2 notches. 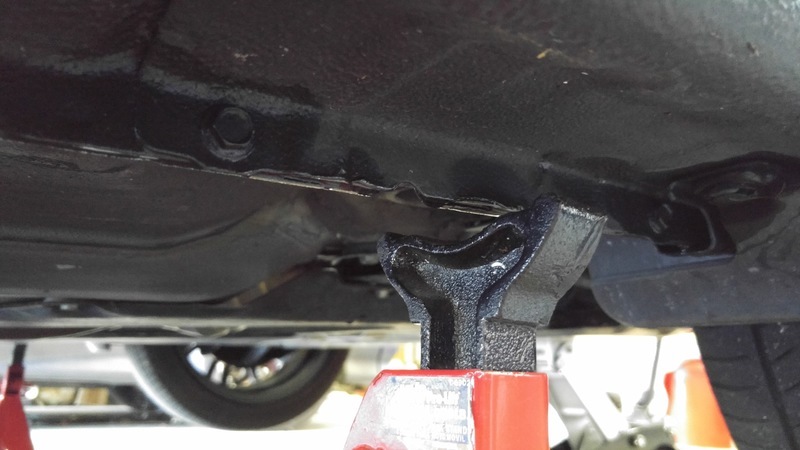 If your jackstand top is U shaped, place the pinch weld in the valley of the U. The jack is not reliable enough on it's own to hold the car. VERY slowly lower the car onto the jack stands. Check and re-check their position as the car nestles onto them. Be sure to heck them both before removing the jack completely. If you are not jacking up the rear. Check the rear wheel chocks to make sure they are still in place. Leave the jack in place (though make sure it is not holding the weight of the car). 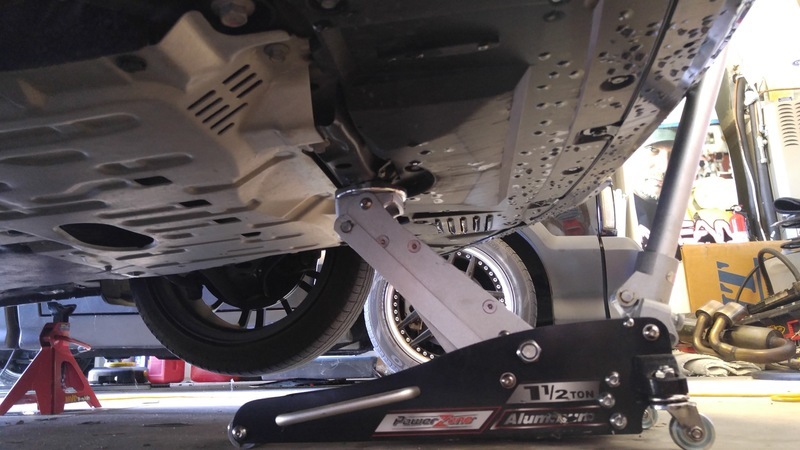 If something goes wrong with one of the jack stands, it may lift or support the car in an emergency. If you need to have all 4 wheels off the ground, you can now jack up the rear of the car. The rear center jack point is the rear differential. Slide the jack under the car (again taking care to not smash the handle into the paint). Jack the rear of the car up slowly, watching the front jack stands for stability. If at any point, they move or slide, feel free to lower the car and reassess. When the rear of the car is high enough. 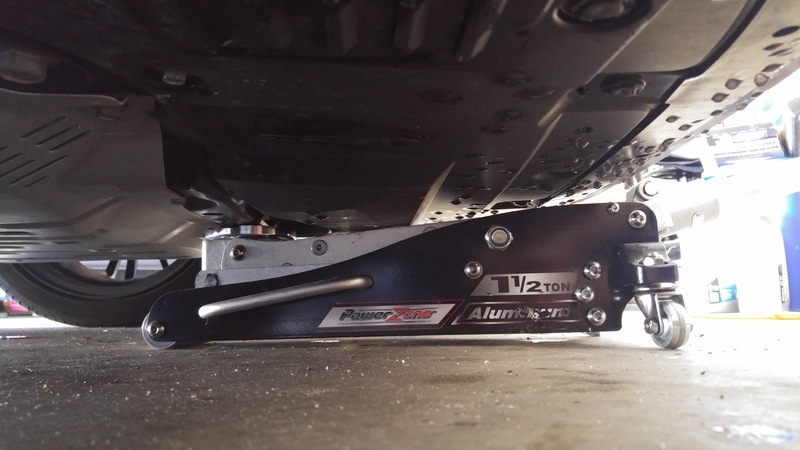 Place the rear jack stands under the rear jack points in front of the rear wheels. They are marked the same way the front ones are. Slowly lower the jack to rest the car on the jack stands. 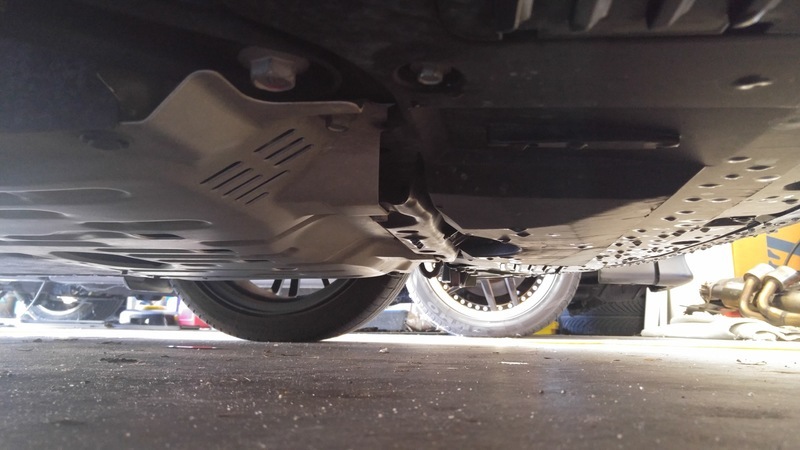 Before you get under the car, make sure you test how secure the car is. Depending on the type of work you're doing, you may be banging or really torquing on some rusted bolts. Gently nudge the car to make sure no movement is going to occur while you're under the car. If it moves at all you may need to re think your equipment and or location.